Some weapons in The Division 2 can dish out the damage, but without mods they may be a tad unstable. Since the mods system has been overhauled for the sequel, it’s important that you go over exactly how they work and how best to use them with your weapon sets. Our guide has all the information you need to get started. There are two possible ways to get mods in The Division 2. The easiest way is to unlock new perks, which you can find out all about in our The Division 2 best perks guide. As soon as you unlock them, you’ll be able to attach them onto your weapons. The more tedious way however is to unlock blueprints. You do this by completing missions – mostly side missions – which in turn give you blueprints. 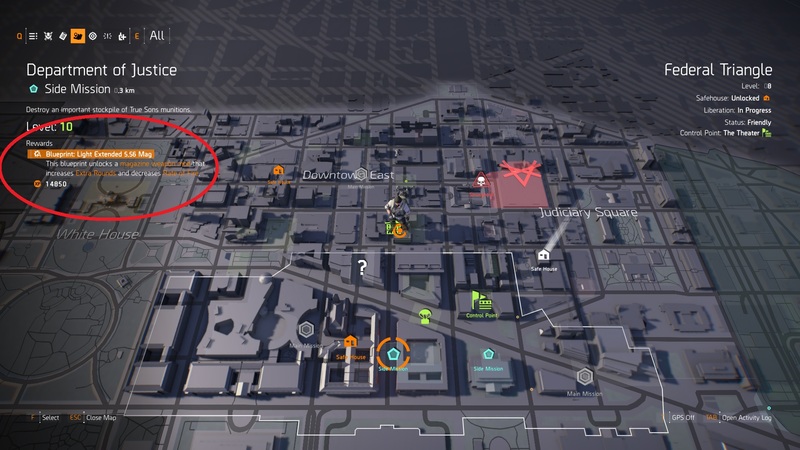 Once you’ve obtained a blueprint, all you need to do is head to your friendly crafting station situated in the White House base of operations – directions to that are in our The Division 2 crafting guide – and make the mod once you’ve got the resources. You should note that once a mod is crafted or unlocked, it is shared across your entire inventory. You can therefore attach your favourite scope to all the weapons that it says you can attach it to. The eligible weapons are found in the mod’s description, viewable in the “View Weapon mods” command in the mod equipment screen, found in the inventory menu and pressing the “mods” key. Head into the inventory and select one of the two skills equipped. This will bring up the skills list, which has all the skills you’ve unlocked. Select a skill and click the option at the bottom right that says “Mod” (you can also press the F key to access this menu). Double click one of the squares (or the circle for cosmetic mods) and select the mod you’d like to equip. With that, this concludes the guide for how to use mods in The Division 2, but we will definitely have some more guides on the game in the coming weeks ahead. Stay frosty out there and we’ll bring you some new intel as we find out more about the game. In the meantime, if you preordered or obtained one of the many special editions to the game, head on over to our The Division 2 preorder bonus item guide for the steps that need to be taken to unlock these items for use in-game.